Behind the Scenes: Is Barack Obama black or biracial? Editor's note: In our Behind the Scenes series, CNN correspondents share their experiences in covering news and analyze the stories behind the events. CNN's Jason Carroll explores the issue of race. Barack Obama's father was from Kenya; his white mother was from Kansas. (CNN) -- The 2000 U.S. Census was the first time Americans were allowed to identify themselves as "multiracial," and more than six million people checked more than one box in the race and ethnicity category. 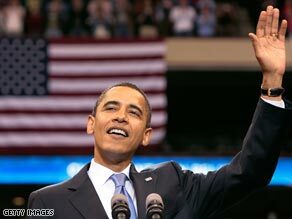 Included in the multiracial category is the Democratic presumptive nominee, Sen. Barack Obama. With a white mother from Kansas and a black father from Kenya, Obama is the nation's first biracial candidate for president. The media, however, have continually called Obama the nation's first major party "black candidate," saying he could make history as the first "black president." But is that accurate? A columnist examining Obama's background summed up his racial identity into one equation: white + black = black. For me, that said it all. "He can't say, 'I'm a white guy named Barack Hussein Obama,' nobody's going to buy that," says cultural critic Michaela Angela Davis. "We're not ready for that." I spoke with a group of young professionals who are part of a biracial support group called Swirl. Swirl was started by a woman named Jen Chau whose father is Chinese and mother is white. Chau says this debate over Obama's racial identity is very familiar and she's been dealing with this issue her whole life. Chau identifies herself as a mixed-race person as do the other members of Swirl we spoke with. Lynda Turet says she could never identify herself as a white person in America because she is also half-Filipina. Both women support Obama's choice to identify himself as a black candidate, but they also understand why he emphasizes his white roots. David Mendell, author of "Obama: From Promise to Power" says there's an idea of a "post-racial" candidate, a candidate who transcends the labels of race to appeal to all races. He says though most Americans view Obama as black, he has been able to use his own experiences to appeal to both black and white audiences and that has translated into political success. This is a debate that will continue as we watch the presidential race. It seems with an issue like this there's no right or wrong answer. As Michaela Angela Davis says, it's a step in the right direction that we are even having this discussion as all. CNN's Susan Chun contributed to this report.